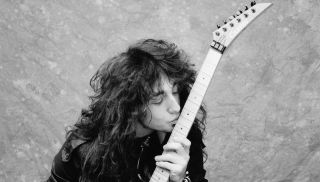 Jason Becker Shares New Song, "Hold On to Love"
The guitarist's new album, 'Triumphant Hearts,' features appearances by Steve Vai, Joe Satriani, Paul Gilbert and others. When it comes to heartbreaking stories in the world of guitar, there aren't many that can match that of Jason Becker and his more-than-25-year-long battle with ALS (Amyotrophic Lateral Sclerosis). In the video below, guitarist Danny Young lays down a challenge that's quitefamiliar to Guitar World readers: "Betcha Can't Play This"! Jason Becker has announced plans to record an album featuring new original compositions and performances by many notable guest performers. 16-Year-Old Guitarist Tina S. Shreds Jason Becker's "Altitudes"
Members of the Guitar World crew paid a visit to the Carvin Guitars/Kiesel Guitars booth at the 2015 Winter NAMM Show in Anaheim, California. What if there were one place where you can tune in to see ALS Ice Bucket Challenge videos by your favorite rockers, guitarists and long-haired, music-biz hangers-on?